One of the most common software tools for volleyball scouting is DataVolley. Many professional and national teams use this software to record their match data. With the increasing usage of data analytics in sport, it is important to ensure that such data are accurate. 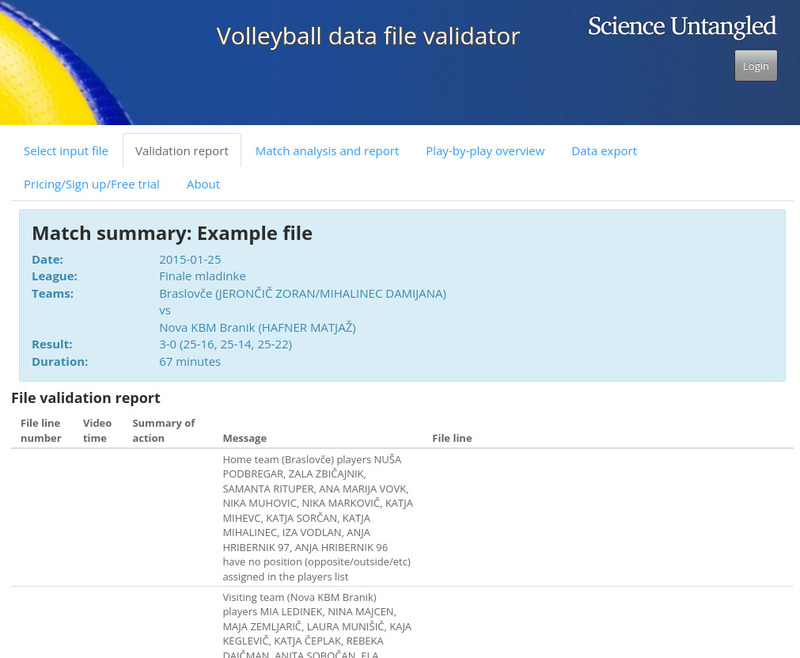 We have developed an online validation tool that can check a DataVolley file for scouting errors and inconsistencies. It will detect errors such as backrow players recorded making front row attacks, substitution errors (inconsistencies between the recorded substitution and the actual players on court), points being awarded to the wrong team, and plays that could not have occurred as recorded (e.g. a team blocking its own attack). Our tool is being used by scouts and coaches from a number of professional and national volleyball teams. The tool is free to use (subject to limitations). Subscriptions are available for users wanting unlimited use, customized validation, or other functionality. Update March 2018: the validator now includes a match analysis summary, with a range of performance statistics derived from the data. Note that this tool is not associated with or endorsed by DataVolley or dataproject.com. For more information about DataVolley, see http://www.dataproject.com/IT/en/Volleyball.